Collecting old, vintage silverware is weakness of mine, along with red, blue, and brown transferware, chocolate, and anything dog- or horse-themed, among others. Why collect old silverware?, you might ask. I suppose the answer could just be because I like it, but, for me, there must always be a reason for everything....so I did a bit of self-analysis and loosely organized the results into four categories. 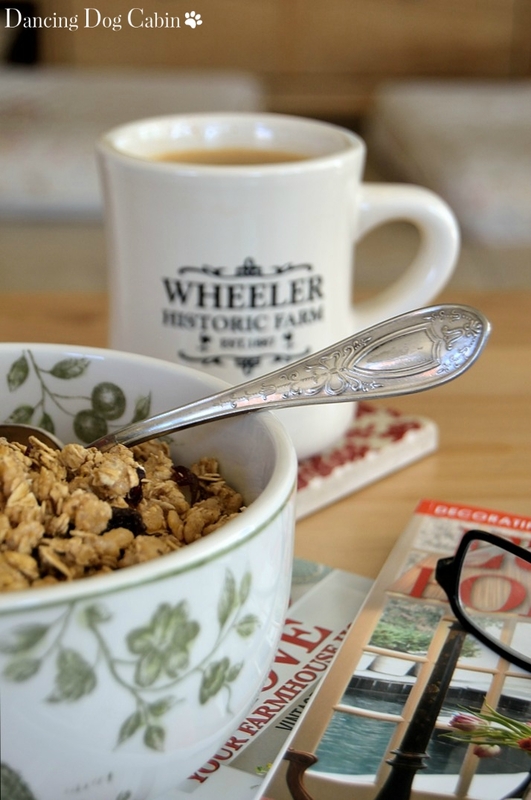 I love the way a pretty silver fork or spoon feels in my hands, and using vintage silverware with it's intricate, old-fashioned patterns makes every-day eating feel special and elegant. OK, not every meal is a leisured, sit-down affair and I don't always have the time linger over each meal and think about how special and elegant I'm being. 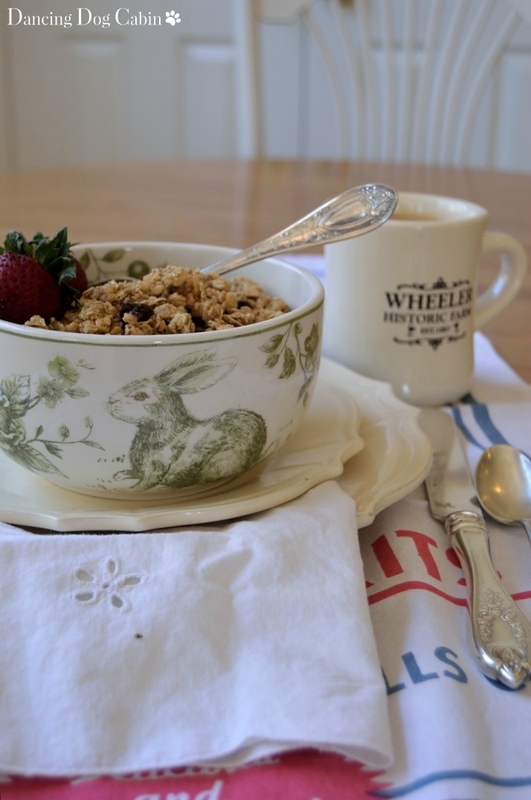 But even if it is a quick bowl of cereal and cup of coffee in the morning while I watch the weekday news before I hit the road, on a subconscious level, it feels a little different from just using some run-of-the mill, stainless steel nonentity that I purchased from some big box store or chain retail place. Not that there is anything wrong with stainless steel; depending on it's design, stainless steel can live in total harmony right alongside vintage silver. 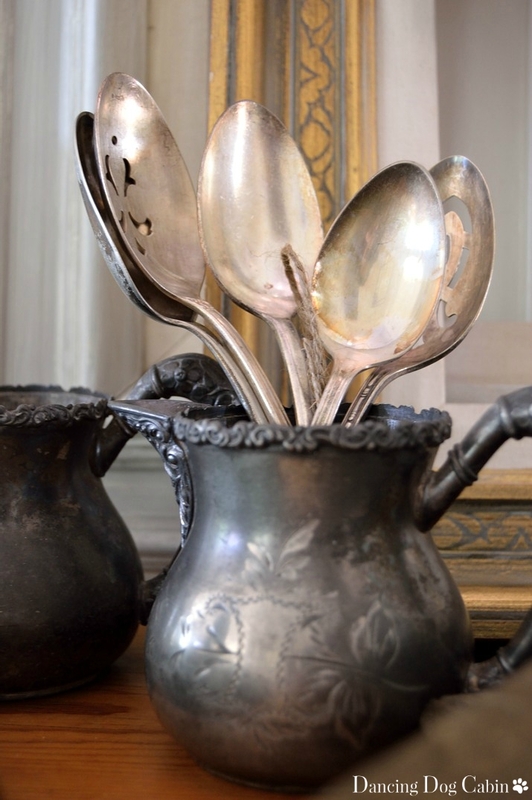 I have a nice collection of stainless steel knives, forks, and spoons with handles that look like old, tarnished silver (or old pewter) that looks very nice indeed sitting next to my vintage silver-- but that can be a separate post. Mixing up a wide range of patterns and design eras can lead to an interesting, collected look when setting a table....which leads to Reason 2. 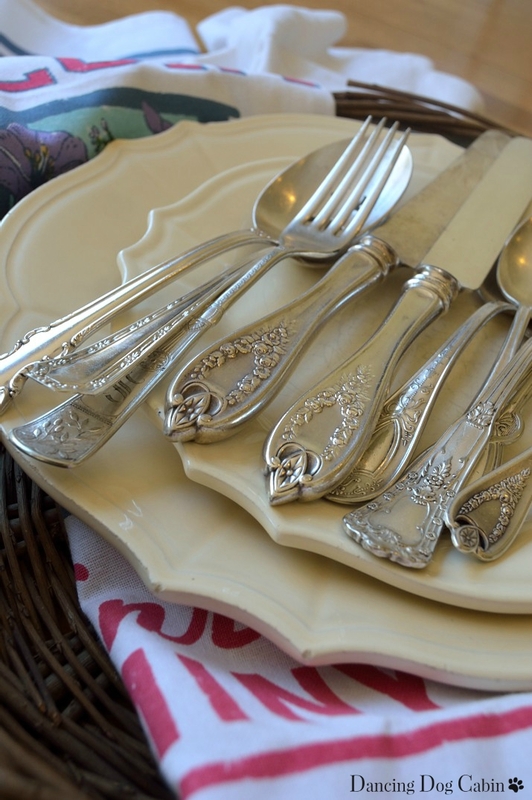 I have a full set of matched, vintage silverware and serving pieces that was a wedding gift from my mom that I love to use for very special occasions such as Thanksgiving and Christmas. 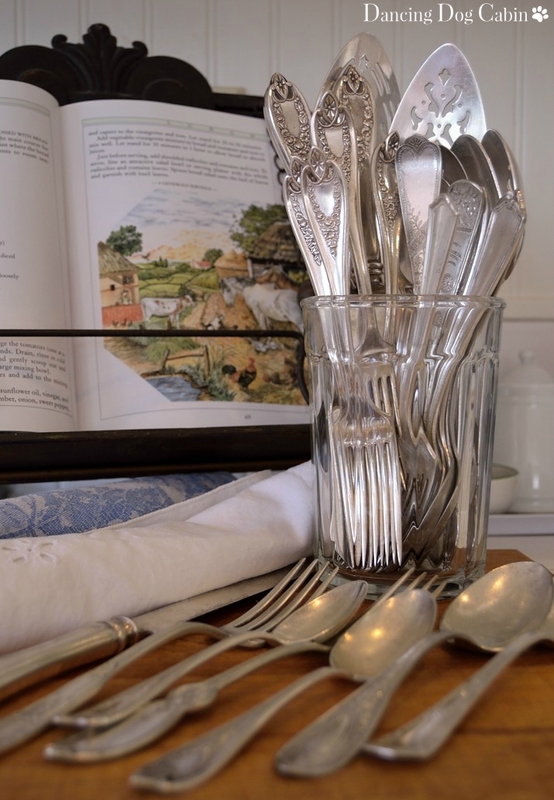 But I also love to mix all the different silverware patterns that I have collected over the years for an interesting, eclectic look for less formal occasions and for every day, quick meals. Whether it's for a sit down meal (unfortunately rather rare in our house these days) or I'm just plopping down on the sofa with my cereal or a plate of brownies, choosing the flatware is a fun activity that allows me to appreciate and enjoy not only my silverware collection, but all the various plates and bowls I've collected over the years as well. 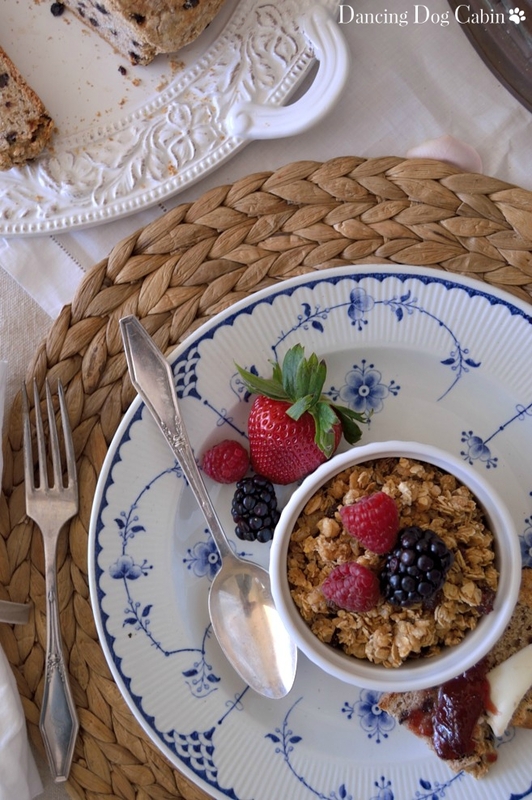 Picking which fork or spoon to use, along with the right bowl or plate, is rather like picking out your outfit every day, and gives you the opportunity to be creative and think outside the box for every sort of occasion. One of the reasons I collect old and vintage things is my love of, and fascination for, history (one of my favorite subjects in school). 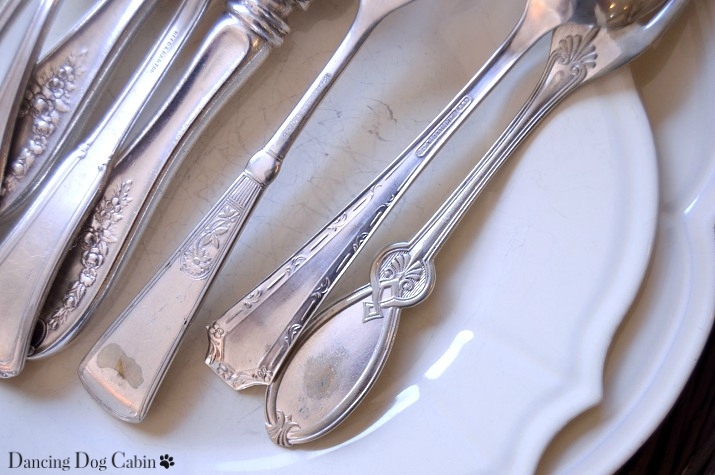 Many of the patterns on old, vintage silverware have been discontinued and are no longer available new, and using these old pieces allows you to create one-of-a-kind, highly personalized tablescapes with items that have a unique story behind each one. That is part of the fun of antiquing I suppose (for more on my vintage collecting and antiquing adventures click here and here). Growing up, the 'silverware' drawer, was filled with, you guessed it-- pretty, mismatched silverware that my mom had collected over the years. This isn't something that I started off doing automatically when I was an adult on my own-- I started off with an inexpensive set stainless steel flatware. I suppose this was a sort of modest rebellion against what I had grown up with. But I soon course-corrected, and, as with the overall decor of my home, moved away from a modern, contemporary table-setting style and filled my 'silverware' drawer with a growing collection of eclectic, vintage silverware. Even though I've evolved back to a style that reflects what I grew up with...there are differences between my style and my mom's. When my mom visits, she has her favorites that she likes to use (smaller, more delicate pieces). I like silverware with bigger, heftier handles that I can get a good grip on. I'm also a spoon fanatic, and probably have more spoons than anything else (because of my cereal-every-morning habit). So I tend to collect both finer, more delicate pieces as well as pieces that are larger and more robust. I found most of the spoons shown below at an antique store in a tiny town in Utah, they made their first (tarnished) appearance in this post. Using (and washing) old silverware constantly seems to keep it from getting tarnished. It does get a bit yellow over time, so on occasion I go over individual pieces with silver polish, but for the most part, there doesn't seem to be a need for constant polishing if you use it all the time (it doesn't get that near-black tarnish that silver gets if it sits out too long). This is a good thing, since constant polishing will strip away silver plate over time. 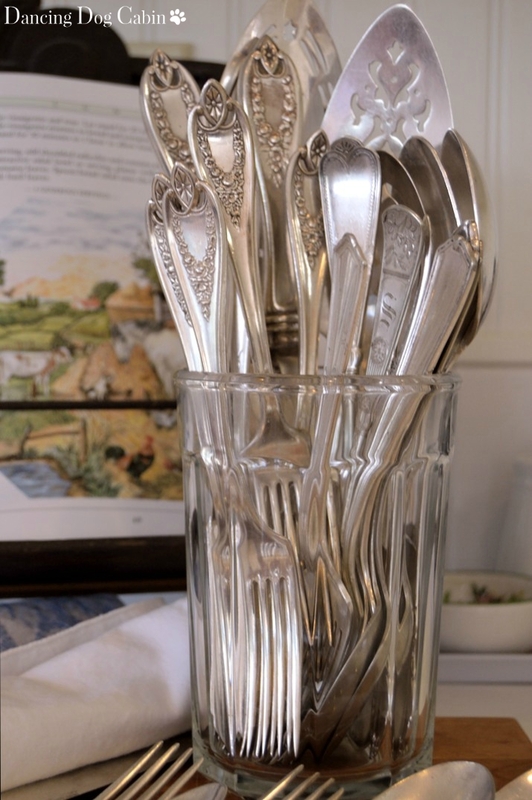 Do you like to collect vintage silverware? You have some beauties. I have a few pieces that I started collecting after I started blogging. Thanks Kim! I've been collecting for a while- well over 10 years. I'm with you on collecting. My mother in law gave me her set she got when she married 68 years ago. She kept it in a box and never used it. I have her silver mixed with all the random ones I've gathered over the years and I keep them all out where they can be seen and used. What luck to end up with your mother-in-law's set! Amazing that she had it all that time and never used it. Would love to see your lovely blog sport a nice delicate serif type face to go along with your beautiful topics! Thank you for your input Teddee. I try to balance readability with aesthetics and I find that Arial is the most readable for the text in my posts (or maybe it's just my bad eyes). And you're right... the set I use everyday never needs to be polished. Amazing! I'm not sure why, but using silver all the time definitely prevents it from tarnishing. Thank you! Yes, the little pitcher and sugar bowl (I think that's what it is) were a lucky find. I'm afraid there isn't much silver left on either, but I still like the shape and design. Yes, I do love vintage silver! I can't really say I have a collection, but I do have a full set of my grandmother's, and a full set up my mom's. I have a couple other random pieces, too. I love your photos of your silver - so elegant! Mismatched things are among my favorites and I like that you collect and use them. I always look at vintage silver but never buy, but seeing how fun it would be to combine different patterns may change that. Thanks Lulu, I'm glad my post inspired you! 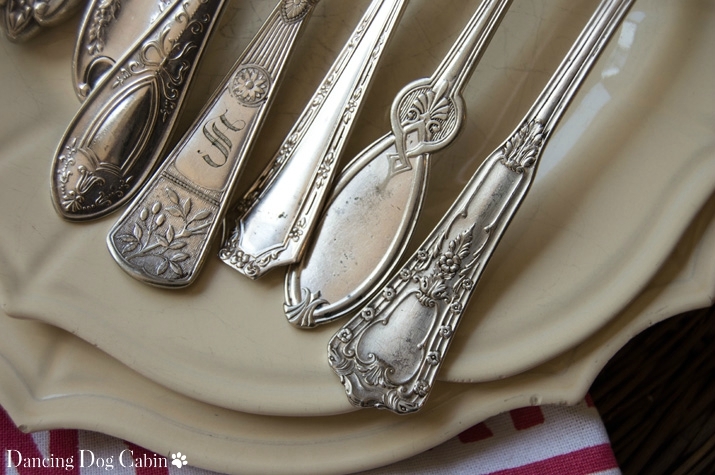 I love your collection of vintage silverware and the fact that you do use them. I was not aware that they can go in the dishwasher. Love how you displayed them. Thank you! 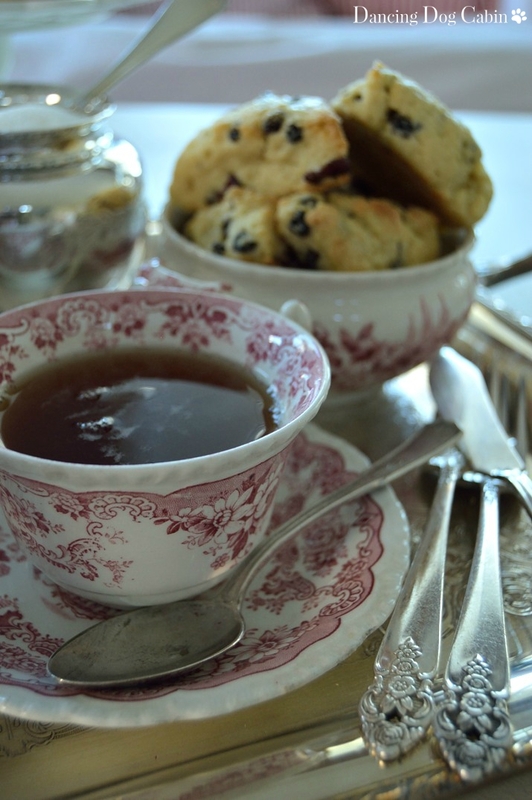 I'd love to join your linkup-- thank you for inviting me. I do collect vintage silver as well as china and I agree about the history of it being a tantalizing bit of history in my hands. My cousin just gave me a tiny silver spoon from her collection of thrifted treasures and I can't wait to show it off at my tea party. I also have my mother's wedding silver which she received from my grandparents on her wedding day. I cherish it. Thanks for sharing. That's wonderful that you have your mother's wedding silver. My mom found the set that she bought for me at an antique store. Thanks for visiting. My dear Melissa, I absolutely loved this post! I was just at an antique store on Wednesday and there was a large basket of vintage silverware. I kept picking through them and found several that I almost bought, but decided not to....now I wish I would have brought them home with me. Thanks for sharing your loveliness with Roses of Inspiration. Hugs! Thank you Stephanie! I do that all the time (passing up a great find, and then regretting it later). Sometimes it's there when I go back to get it, sometimes it's not. I love vintage silverplate! My mother gave me two sets-one from the 30's and one from the 40's. I added pieces on eBay to complete the sets. I also have my wedding Silverplate from the 70's. I love to switch them out depending on which china I use. I love silver from the 30s and 40s, especially the 30s since pieces from that decade tend to be Art Deco in style. Thanks for visiting! Thank you Karen! Thank you for inviting me to your link party! I love your post. It is well written, exquisitely photographed and showcased. A very beautiful collection that is close to your heart. I collect vintage silver too. There is nothing else like in my opinion. Its patina and visual appeal is unmatched. Janet, thank you so much for your kind words! I feel the same way about vintage silver-- it makes even a basic, quick bite to eat a little less ordinary. I am convinced that I should start (yet another) collection! I love that you actually use them instead of just putting them up on a shelf. Thanks so much for sharing at Inspiration Thursday! Have a great week! Thanks for stopping by Lela! 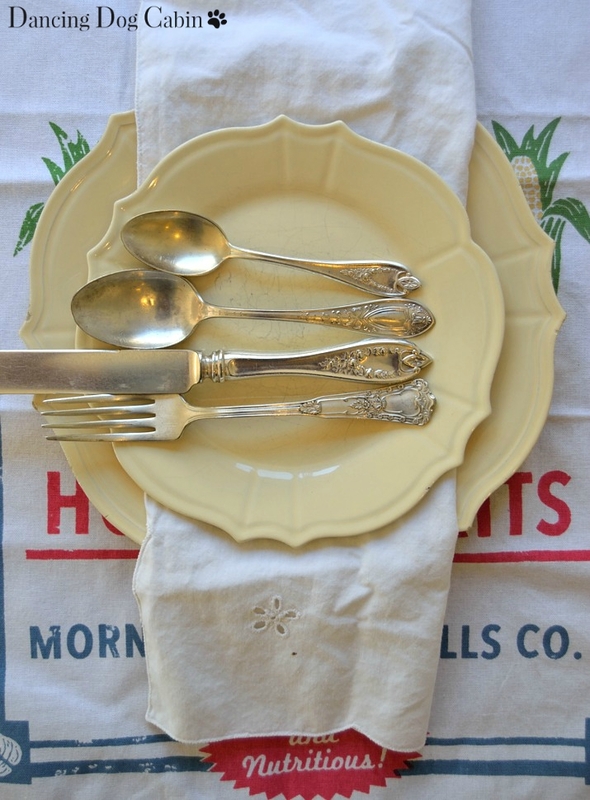 I just started collecting vintage silverware last year. I just have odds and ends, but I love it! 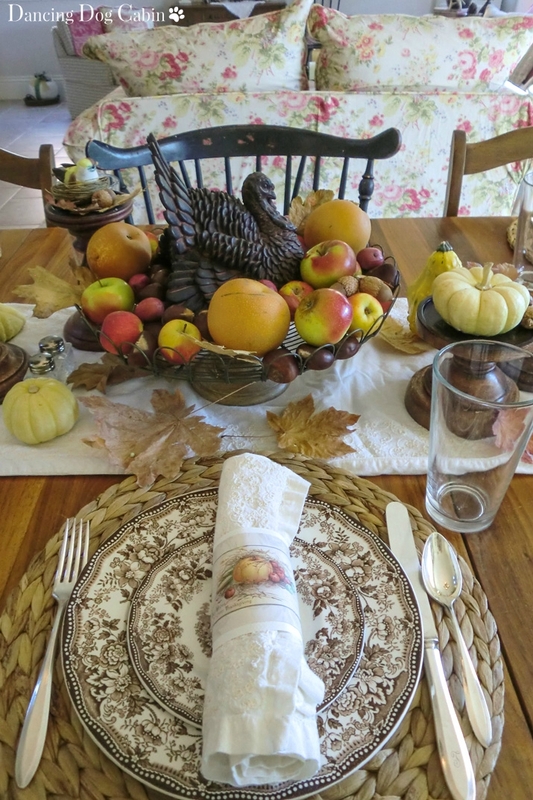 Can't wait until I have enough to set a table. I love displaying it in it's tarnished state. If I set a table I would clean it. I love your four reasons and you have some lovely patterns! Thanks for sharing with SYC. Thanks Jann! Yes, if I have silver flatware that's super tarnished, I definitely polish it before eating with it. Just saw your link at Amy's and was intrigued by your blog name and the vintage silver pic. You have some lovely pieces and wrote so beautifully about them. And may I say you have showstopper pictures as examples? Just beautiful and I know that time went into this post! I love collecting it too and am of the age where we picked out wedding silver, back in the old days! I still enjoy using it but it is the oddballs I've found over the years that charm me, just as yours did. Thank you Dewena! Yes, I'm always amazed at how long it takes to put a post together. Thanks for visiting! Congrats, Melissa, on being the "most clicked" link at Best of the Weekend! Wow, Amy, that's really exciting! Thanks for letting me know! I'm enjoying my visits to your pretty blog. Happy to have found Dancing Dog Cabin. Thank you Sarah! I'm glad you were able to find me. I have wanted to start using my vintage silver but didn't really want to hand wash them every time I used them. You solved that problem for me. I am getting mine out tonight! Hi, i loved ur post! I found u thru pintrest. I was wondering if you could share the name of the silverware pattern with the pointy handle? Thanks! The mark on the back says 1947 Rogers Bros. I think that may the manufacturer rather than the pattern name. I got those pieces at an antique mall. I’m sorry I don’t have more info.